Not a big fan of MMORPGs, but you can't beat the price... Might give it a try. If you do try it out let us know what you think! I have tried DDO. it was a neat game. It basically felt like D&D and Tomb Raider mixed together. It has a nice action game feel and has a good pace. My complaint was the lack of the "outdoors". You spend all of your time going to specific locations where you repeat the same missions over and over again. With it being free, it is totally worth the time. I recommend it. In fact, I intend on renewing my account one of these days. Pretty much what Count Zero said. I'm having fun on this with my Warforged Fighter. Although, if you do play, and your class has ANY kind of solo ability, run the dungeons on Normal difficulty (if you're soloing). Solo difficulty is really easy and presents no challange to my fighter at all. Normal, on the other hand, I feel like there's a chance I might actually die, and have even had to use healing potions to make it through two dungeons so far. That said, I'm also not yet 2nd level (there are 5 ranks per level, though, and I'm currently Level 1, Rank 4, which means I'm basically a level 4 toon in other MMO's). All in all, it's been pretty fun and has a good D&D feel to it. [quote="BlanchPrez"]That said, I'm also not yet 2nd level (there are 5 ranks per level, though, and I'm currently Level 1, Rank 4, which means I'm basically a level 4 toon in other MMO's). Their level system is the thing that actually made me quit playing the game. I just didn't enjoy how they handled it. They were trying to drag the levels out for 60 levels, rather than just doing 20 or 30 like there are in D&D. I think too many MMO's focus on the grind and having tons of levels. I would rather have fewer levels and crunching and more content. Most designers haven't figured out the game isn't about leveling, but about the play itself. Players will gladly play a game that has no persistence if the game play is good. mmm... I get your point, but I disagree. MOST MMO players (myself included) LIKE leveling their toon. Getting more levels is fun. Getting new powers and new equipment is fun. This is what drives the vast majority of the millions in WoW. Thus, tooling your game to what the majority of the paying public enjoys is not a bad idea. However, you are correct in that there are a lot of gamers out there that would stick around on a game that is fun to play even if the number of levels is pretty small, as long as there is plenty of stuff to do once you max out your level. If you hit max level, and the game is done, you quit playing, which is bad for a persistent game like MMO's. Thus, adding new levels is an easy fix to this problem, because coming up with new challenges for a maxed level toon is tough. 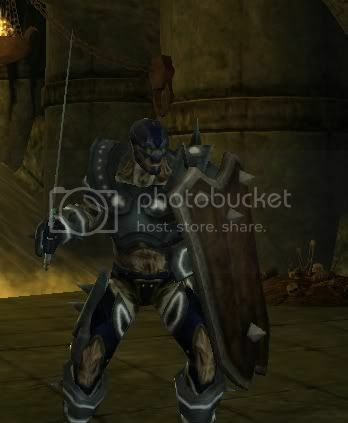 All that said, I wanted to share my DDO toon, Cozar Silverblade the Warforged Fighter.